Powers/Abilities: A driven and compassionate psychiatrist, Dr. George Jefferson has the strength and stamina of an average man his age. History: (Amazing Spider-Man I#296 (fb) - BTS) - Dr. George Charles Jefferson was a psychiatrist for twenty-five years. (Fantastic Four I#267/Web of Spider-Man I#4/Amazing Spider-Man I#317 (fb) - BTS) - Becoming the head of the South Brooklyn Psychiatric Facility, Dr. Jefferson held regular sessions with his patient Dr. Otto Octavius, better known as the criminal Dr. Octopus. Jefferson oversaw the regular administration of unspecified medicine into his patient. His work usually resulted in fourteen hour workdays. (Fantastic Four I#267) - Jefferson was visited by Mr. Fantastic of the Fantastic Four who requested Octavius' assistance in dealing with the radiation-based complications his wife, the Invisible Girl, dealt with while giving birth to their second child. Jefferson was amazed at the rapid progress Mr. Fantastic made in appealing to Octavius' humanity and began the process of preparing the papers for Octavius' release. (Web of Spider-Man I#4 (fb) - BTS) - Jefferson continued his sessions with Octavius, delving into his childhood. (Web of Spider-Man I#4) - Jefferson ended another session by congratulating Octavius on his progress, but reminded him that they still had far to go. (Web of Spider-Man I#5 (fb) - BTS) - After Octavius' breakdown and escape from the South Brooklyn Psychiatric Facility, Jefferson was quoted in the Daily Bugle suggesting Octavius' preoccupation with Spider-Man was the cause for his actions. (Amazing Spider-Man I#296) - After Octavius was returned to the South Brooklyn Psychiatric Facility, Jefferson and his colleague Dr. Barnum began sleep therapy on the patient to cure him of his crippling obsession with Spider-Man. Jefferson halted the experiment and rushed to Octavius' side when visions of Spider-Man shot his pulse rate up. Comforting a shaken and terrified Octavius, Jefferson told him they'd continue the therapy another day. After another session of sleep therapy that proved as futile as the first, Jefferson witnessed Octavius' mechanical tentacles burst into the lab and tear off with his patient. Approached by Spider-Man, Jefferson agreed to publicize a 'tell-all' memoir to draw Octavius out of hiding. Confronted by his former patient, operating once again as Dr. Octopus, Jefferson apologized and stepped aside while Spider-Man and an armed police unit burst forward to arrest Doc Ock. In spite of their best efforts, Dr. Octopus managed to escape. (Amazing Spider-Man I#317) - Jefferson was contacted by Spider-Man for assistance in defeating Venom. (Amazing Spider-Man I#317 (fb) - BTS) - Spider-Man told Jefferson the full details of his relationship with the symbiote that later bonded with Eddie Brock to become Venom. Jefferson suggested that the symbiote had a love-hate relationship with Spider-Man, in as much as it wanted to re-bond with him but also punish Spider-Man for separating himself from it to begin with. (Spider-Man: Funeral for an Octopus#1) - Jefferson attended Octavius' funeral, in the wake of his former patient's brutal murder. Jefferson lamented his inability to free Octavius from his devastating psychosis. Jefferson's first name, George, was revealed in the Daily Bugle article at the start of Web of Spider-Man I#5. Yup. George Jefferson. A reference that falls somewhere between amusing and awful. He was later referred to as Charles Jefferson in Amazing Spider-Man I#296. It's possible Jefferson's first name is George but he prefers to go by Charles (for obvious reasons), or it could be that his name is Charles Jefferson and the Daily Bugle gave the wrong name in their story (possibly while thinking of Sherman Hemsley). 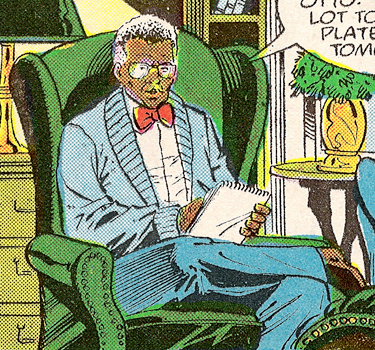 You almost get the impression from Jefferson's return appearance in Amazing Spider-Man I#317 that David Michelinie was setting him up to be Spider-Man's go-to psychiatrist type, or that he was at least trying to introduce that as a possibility for future writers to pick up on if they so needed. Instead Ashley Kafka was introduced a short while later and took over that job (at least until the character was fired from her job and fell into comic book limbo). 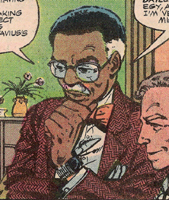 Daily Bugle reporter Keith Williams was most likely named for prolific Marvel Comics artist Keith Williams. George Jefferson, character portrayed by Sherman Hemsley on All in the Family and The Jeffersons, father of Lionel, husband of "Weezie", @ All in the Family "Henry's Farewell"
(Amazing Spider-Man I#296) - Dr. Barnum assisted Jefferson with his sleep therapy treatments on Otto Octavius, handling the operation of the machinery used in the therapy. (Fantastic Four I#267) - Myrt walked down a corridor just as Jefferson and Mr. Fantastic escorted Otto Octavius out. Curious, she asked co-worker Frank Wilson what happened, and suggested that if Mr. Fantastic did get through to Octavius it should be written up in a psychiatric journal. (Web of Spider-Man I#5 (fb) - BTS) - Keith Williams covered Dr. Octopus' crime spree for the Daily Bugle. In addition to speaking to Jefferson, Williams quoted the Mayor of New York who said "Ock is a quack". (Fantastic Four I#267) - Frank Wilson was present when Mr. Fantastic arrived at the facility to speak to Octavius. Opening the door to Octavius' room, Wilson stood by while Mr. Fantastic's successfully appealed to him for assistance. Amazed, Frank entered Octavius' empty room and found paper dolls cut to resemble octopuses.